On Scene: On Location: FDIC Tradeshow, Booth Setup! 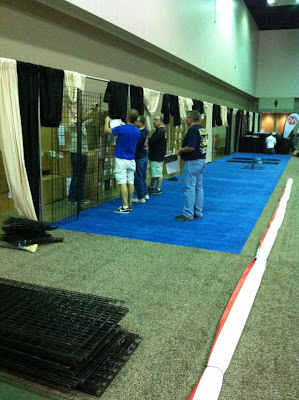 On Location: FDIC Tradeshow, Booth Setup! Yesterday our Tradeshow Team arrived in Indianapolis, Indiana to get TheFireStore's booth ready & setup in anticipation of the FDIC Show that begins tomorrow! The FDIC Show is the largest Firefighters convention (including training, too) in the US and it's attended by many of our loyal customers. Our Tradeshow Team at TheFireStore is excited to see you, tell you about the great deals, and assist you with an inquiry or sale. So stop on by booth 108 and say hello! Until then...here are a few behind-the-scenes shots, giving you just a tiny glimpse into the work that goes into setting up such a large booth! Stay tuned for more updated photos! As always, our online website is up with sales running! Wildland items are still 10% off, as well as the Tru-Spec pants on sale...check it out! See you at the show, or see you on our website!